Murky Memories: When did breakfast cereals outlaw the word “sugar.” Remember when Dig-’em promoted “Sugar Smacks” instead of “Honey Smacks?” I do. I also remember the cereal giving the milk a sweet carmel taste and making your hands all sticky when you ate it right from the bag. Good times, good times. 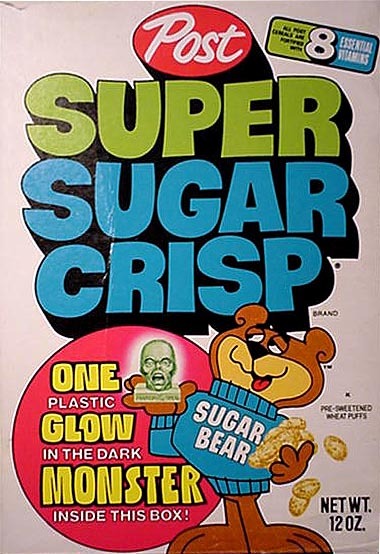 Sugar Bear was the best, with his Dean Martin-like “Can’t get enough of that Sugar Crisp…” . Perhaps I feel the greatest affinity for Sugar Bear because in 1987 I wore a Sugar Bear costume at the Wilton Villiage Market. Go me! It was the kind you’d see at Disney or Six Flags, but I was Sugar Bear… and Sugar Bear was me.